'I'm too different. When we were recording Watermark, I would often go into the studio after hearing the latest songs in the street and say "What are we doing here?" She works obsessively and talks incessantly about music because, really, there is very little else in her life. 'I made the conscious decision not to have a boyfriend in my life because I need to concentrate on my career. Until you've got your career on the right road, you can't spend your energies and your time on anything else - and that includes men. She can't be bothered with boyfriends and loathes Top 10 music. Yet this girl still made No. 1 in the charts. By Anne Barrowclough. When Enya does finally get up on stage to perform, it's almost guaranteed that her only movements will be her fingers on the keyboard. She will sit there almost immobile, pouring her heart out through her fluttering fingertips. Not for her the bouncy bopping of Kylie, or the sweaty leaping of Bros. Although she is now sailing up the pop charts with her first solo album Watermark, Enya, this fragile girl who has never bought a record in her life and whose roots are steeped in classical and choral sound, is the complete antithesis of the pop heroine. 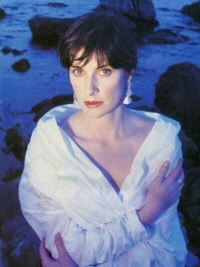 It is not just the classical clothes, the huge, dreamy eyes and the shy, almost other-worldly demeanour that mark out Enya as unique in the pop world. It's her music: Four-walled, intense and haunting. Its reverberating vocals and its Latin and Gaelic lyrics make you think of great cathedral choirs and ancient Celtic pagan ceremonies rather than black leather, rebellion and bubble gum. It is difficult to say just why this semi-classical music has hit a chord with today's pop market. Yet it has. Last October her single, Orinoco Flow, became the year's most unlikely number one. And Enya doesn't know why. She doesn't like pop music, she doesn't understand it, she finds it depressing and frightening and downright confusing. 'I hear today's music in shops and supermarkets and wonder what on earth I'm doing trying to write music,' she says. 'I keep thinking that that (and she says it with utter disgust) type of music is what people really want. I don't like it. But I don't understand how my music can ever compete against it. Enya is a quite extraordinarily beautiful, waif-like girl of 27 with huge eyes and a lilting Irish voice. Her world is her recording studio, and she appears disinterested in anything else. It's understandable, in a way, because music has always been her life. Enya's father used to be in a band before he bought a pub, where he still entertains, and her mother also played in a dance band before becoming a music teacher. As she was growing up, Enya's mother used to take her - along with her eight brothers and sisters - to local competitions. At college, Enya studied classical music and piano, and she was determined to be a music teacher. She never got near a classroom, of course. Instead, in 1980, Enya joined the Irish group Clannad - most famous for its haunting theme music to the series Harry's Game - as its keyboard player. Clannad was a family group, made up of her two eldest brothers, a sister and an uncle. Within two years Enya was fighting with her family, and in 1982 she left Clannad to go solo. Looking back at those two years, she believes she was never right for Clannad. 'They were my family,' she says, 'but I hardly knew them. 'When I was still at school, they were touring with Clannad so I never saw them. And suddenly I was thrown in with them 24 hours a day, touring the Continent. We had nothing in common. For a start, there was a nine-year age gap between the youngest of them and me, and they thought of me very much as the kid sister. They didn't really take me seriously. For the last six years Enya has lived with Nicky and his wife Roma Ryan in their Dublin home. They are not, she stresses, surrogate family - she is in constant touch with her own family. But they are incredibly close colleagues. 'Without Nicky and Roma, "Enya" wouldn't exist,' she says. It was Roma who sent a selection of Enya's first solo pieces to David Puttnam, who commissioned her to write the theme for his 1985 movie Frog Prince. Soon after, she composed the theme music for the BBC series The Celts, and that was when she evolved the multi-textured sound which has become her trademark. 'I don't sit around wondering if I'm missing out on life because I can think of nothing I would rather do than compose and play music. Really. I really do love it. 'I do sometimes go out with friends in the evening and I enjoy that, but I prefer being alone in the studio.' As Enya is getting ready to leave, Nick Ryan enters the room and chats about the pop world's tendency to eat up its inhabitants. 'I don't want that to happen to Enya,' he says, watching her protectively. Enya gazes at him silently and turns away. Her look says it all. The pop world won't eat me up, it says, because I'll never be a part of it. In its January 6 1989 edition the Daily Mail, a British tabloid newspaper, printed this item which describes the popular image of Enya at that time. In more recent interviews, Enya has said this article, and in particular its title, gives a wrong impression; she's not a "Miss Prim" and does occasionally let her hair down, so to speak. Nevertheless, her public image remains pretty much as this article described. The writer's research on Clannad was a bit shaky: a picture accompanying the article shows the traditional personnel of Clannad: two brothers, two uncles (not one, as the article says), and Enya's sister, Maire, but no sign of Enya herself, with the caption: "Before the split: Enya with 'family' band Clannad". The main picture shows Enya, elegantly dressed as ever, in the kind of ladylike sitting posture taught by "finishing schools" for the daughters of the aristocracy (and probably also by convent schools such as Enya attended). The caption reads: "Demure Enya: Her cool, classical sounds have swept aside the bouncy boppers in the charts"